August was my best month yet for earning income and I'm excited to share what I've been up to! 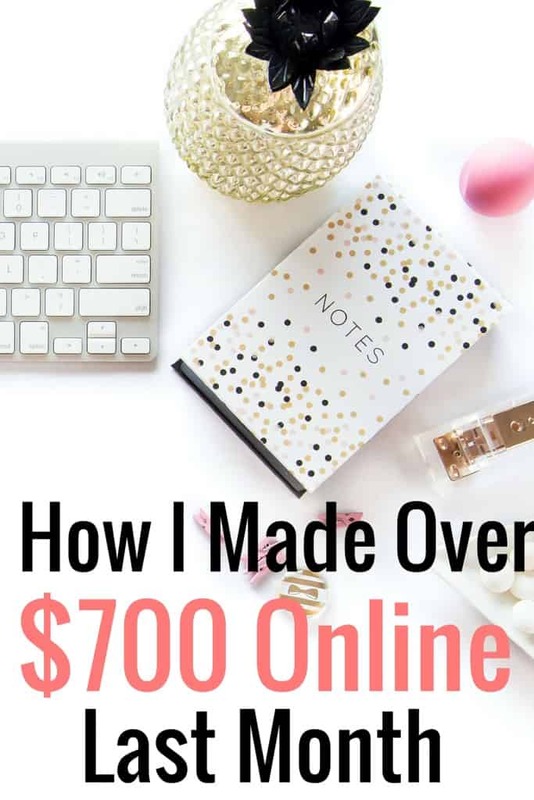 You might have noticed that I renamed this to my monthly online income report. Originally these monthly posts started off as solely blog income report, but now that I am moving towards a freelance career, it makes more sense to change the title. This is my sixth online income report to share! This report only includes income I received from the month of August. I don’t include any money that is pending. If the money isn’t in my bank account, it doesn't make it in this report. My journey to blogging and making money from my blog has been a slow, but steady one. I started blogging almost a year ago, but didn't get serious about my blog until January of this year. I made the smart decision to stop treating this blog like a hobby and turn it into a business. In March, I had my first online income report! Since then, I have been slowly making money each month. So what's different this month versus previous months? While it's been months in the making, I recently announced on this blog that I plan to transition from full time employee to full time freelancer. A couple of months ago I started freelancing in addition to my full time job. Since I made money freelancing in July and in August, I decided I would document and post everything on this blog. This amount is the grand total and before I deduct taxes. Right now I am putting away 30% of each paycheck I earn. I still have to meet with an accountant to go over the best way to operate, but for now I feel like 30% is a solid amount to save. Ebates: Hello, free money! This is my fave company I use when I shop online. I start here before shopping any online sites. It's free cashback on every purchase and the money gets deposited into my PayPal account. It's really hard to turn down free money. I've made almost $750 since signing up, which is crazy. My freelance income is fairly diverse. I am so excited my income comes from various sources for a couple reasons. The biggest reason is I don't like to rely on one source of income. The other main reason I am so excited is because I am not locked into doing the same mundane tasks over and over again. Pinterest management and photo help are two services I recently added to my Hire Me page. I absolutely love this aspect to blogging. I am a really visual person, and I love connecting with bloggers and companies who need help with creating photos for new blog posts or updating old photos for previously published content. I am currently providing consulting services related to my career niche. When I decided to leave my full time job, I was determined to find a location independent job. I knew it was possible, but really had to scour the internet to see what was out there. I did a lot of digging and even wrote a post about all the different job boards I found. The job boards I searched included a huge array of career fields, so I think it's possible to find almost any job online these days. Eventually I found a group specific to my career niche that matches clients with professionals. Get excited because I FINALLY hit the sacred $100 threshold Google Adsense requires to be paid. Even though I will be receiving a check for $104.14 for August, I am not counting it until next month's online income report because I haven't actually received the payment. So for now, I count this as zero income. $19 Apps like PicMonkey, Board Booster, etc. Last month I wrote about how annoyed I was to pay for Google apps, as many readers mentioned they use it for free. I have an upgraded plan so my email address matches my domain name. This means I can add something like [email protected] domain name for companies interested in advertising on my blog instead of it filtering in with client emails. I have small expenses with monthly service subscriptions and apps that are vital to my business. What I don't have listed in these expenses is Tailwind, which I purchased a couple months ago. I already paid for this for an entire year, so I don't count it in my monthly expenses. By the way, Tailwind is completely changing the way traffic comes to my blog from Pinterest. If you want to increase your pageviews, sign up with Tailwind! Finally, to help ease the transition to freelancing full time, I started working with Carrie at Careful Cents. I wanted help on how to ramp up my freelance career (while still working full time) and what steps I needed to land jobs. This has been worth every penny and I landed a client within a couple days of our first meeting! I don't really see my expenses increasing anytime soon. I'm on a DIY budget for now and need to do the majority of work myself. I do like to keep Fiverr in my back pocket for one-off jobs, like technical help, since tasks are $5. I am really excited to see where September takes me. I have four weeks remaining at my full time job, so I won't be limited with my freelance work. Right now I simply don't have enough time working full time, freelancing, blogging and prepare to move across the country. Have you ever thought about leaving your day job and becoming a freelancer? Congrats on reaching your income goals. I just started income reports on my blog. So inspiring ! I really would love to do blogging and freelancing on the side and one day be able to stay at home and do it full time! Would love SD one help in really how to get started! Hi Kimberly, I’ll shoot you an email for some starter tips! Congrats! So encouraged to see that this can be an option for you in the future. What do apps like PicMonkey help you do? PicMonkey is a great way to make images for your blog and Pinterest and it’s FREE (unless you upgrade which isn’t necessary). I actually do the majority of my freelance work in Canva now, which is a similar program. Way to go! That’s a good chunk of money to earn in a month. You are definitely on your way to full time freelancing!